The strongest junior contenders for the awards podium at the 2014 Secret US Classics are all competing in the same session as the seniors. As a group, these juniors look sharp, prepared and raring to go. Nia Dennis said in an interview that she feels confident, and she has every reason to. She looks every bit like a senior out on the floor, and there is no reason that she should not walk away with a gold medal tomorrow. Here were a few of her podium routines. Norah Flatley also looked great and should challenge Dennis for the gold. If she cannot overtake her, she should easily walk away with silver. Here were some of her routines during podium training. As always, her beam stands out amongst the rest and is just so beautiful to watch. The bronze medalist will most likely be one of the following. Ragan Smith looks confident and competitive. This little spitfire wants to win. And her time at Texas Dreams seems to be serving her well. Her “Puttin on the Ritz” floor routine is as darling as ever. Emily Gaskins form, presentation and skill level continue to improve, making her such a pleasure to watch. Jazmyn Foberg will definitely mark tomorrow as her entry into the top junior ranks. Her podium training looked great minus a fall on beam, and her floor routine has the typical MG Elite stamp on it. The Junior Competition was exciting as many different people were showing strong performances. 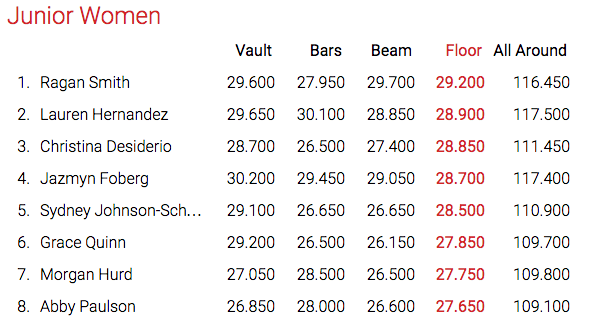 The balance beam took many of the possible champions down, but overall it was a really great competition. Thanks to USA Gymnastics, we have videos of every routine! Third Time’s a Charm for Bailie Key – All-Around Champion. Bailie has been on the elite scene since 2010 – qualifying Junior Elite at just 11 years old. A member of the Junior US National Team since 2011, she already has a significant amount of international experience. At 14, She carries herself like a veteran, with two years to go until her senior debut! She won with an all-around score of 58.250 in her third US Classics. She had a beautiful meet, and what is more amazing is that rumor has it that she did it with the stomach flu. Amelia and Lexie Priessman are two names that always go together. We haven’t seen one without the other in training videos much less competition in their elite careers. One year older, Lexie moved on to the senior ranks. 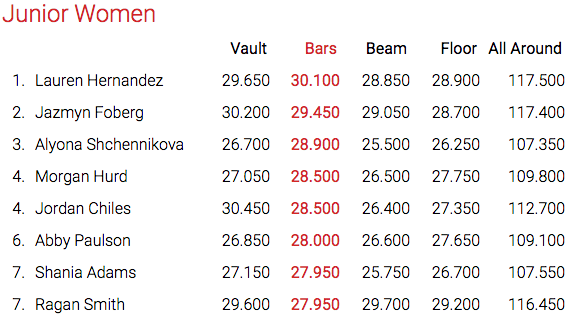 But Amelia did just fine and took the silver medal with a 57.950. Nica has been slowly, but surely climbing her way through the ranks over the past few years. She took the bronze medal with a 56.800 her final year as a Junior. All videos from USA Gymnastics. The first thing I noticed when I walked in was all the sparkles. Really, it is hard to miss! But the second thing was how much more businesslike the women are. Even these little juniors. 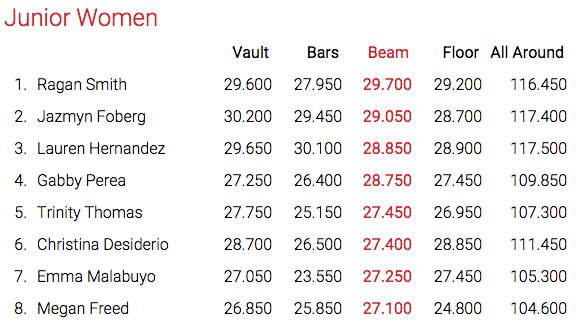 There were definitely some stand outs and the future of USA gymnastics is looking great. For a full effect, read through Gym Examiners quick hits and check out all the routines on USAGymnastics youtube. I think that US gymnastics has heard the complaints of no artistry. There were so many beautiful, well danced, polished floor routines out there today! It was a delight for this floor lover’s heart. Also, Texas Dreams is a force to be reckoned with. Kim Zemeskal’s girls look awesome on every event. Polished, with great attention to detail. She is also delightful to watch with her girls. Of course, you can’t ignore Lexie Priessman with her almost 2 point lead after night one. Her floor routine was on fire- she REALLY danced it up and did some incredible tumbling to boot. Her 15.25 outclassed the rest of the field by over half a point! 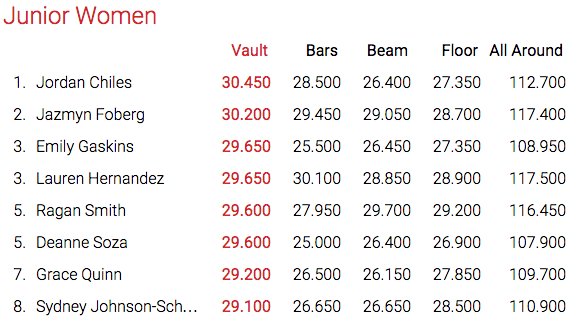 Priessman, Amelia Hundley and Katelyn Ohashi all look like seniors out there. They just have a different quality to their competition and will be ready for next year without missing a hitch. And then there is Bailie Key. It is hard to believe she is only 13. She competes with the finish and professionalism of a senior, and has the difficulty to match her poise. It is hard to imagine how incredible she will be by the time she finally becomes a senior if she continues on this pace. Three other gymnasts must be mentioned. First up, Simone Biles. She is just a little bundle of dynamite! What power! Even when she is just walking across the floor she looks like she could combust. She is a delight to watch on every event. Second is Nia Dennis. This little girl is a young Awesome Dawsome. She has beautiful dance and tumbles and does release moves on bars up in the rafters. Last but not least is Lauren Hernandez. I must say, she is my new favorite junior. The girl can dance! And every movement is finished with precision and grace. I love watching this one! She didn’t have the best day, but I can’t wait to see her again.